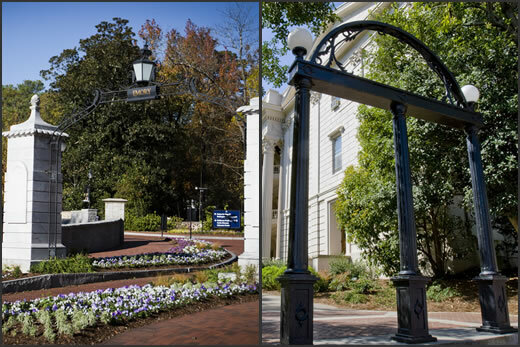 The Emory University gate and the University of Georgia arch. The University of Georgia and Emory University are strengthening their collaborations to elevate the position of the Atlanta-Athens corridor as a national hub for infectious disease research. The two institutions are currently working together on grant and contract-funded projects totaling more than $45 million, including a Center of Excellence for Influenza Research and Surveillance and a malaria research consortium, both funded by the National Institutes of Health (NIH). In addition, they are developing a new diagnostic test for tuberculosis and working to create a new HIV vaccine, among other projects. These partnerships and others like them will be enhanced by a series of ongoing meetings among senior administrators initiated by the institution’s two presidents, Jere W. Morehead of UGA and James Wagner of Emory, shortly after Morehead came into office. "The combined research strengths of our two institutions, particularly in infectious diseases, create a formidable effort to develop better methods of prevention, detection and treatment for some of the most challenging global health challenges," says Wagner. "These collaborations reflect the complementary strengths of two of Georgia’s leading research universities and our shared commitment to conducting globally significant research," said Morehead. "By working together, we are advancing the state’s economically important bioscience sector while laying the foundation for improvements in health and quality of life around the world." Earlier this year, the Emory-UGA Center of Excellence for Influenza Research and Surveillance (CEIRS) received a $3.6 million contract—with potential funding up to $26.7 million over seven years—from the National Institute of Allergy and Infectious Diseases (NIAID) of the NIH. The Emory-UGA CEIRS, originally launched and funded in 2007, is one of five national centers that integrate research to lessen the impact of epidemic influenza and improve pandemic influenza preparedness. The Emory-UGA CEIRS is led by Walter Orenstein, MD, professor of medicine and associate director of the Emory Vaccine Center. Researchers at Emory are studying how flu viruses cause infection and spread in the population, the human immune response to flu vaccines, flu infection in pregnancy and the response to flu vaccines in pregnant women. Under the leadership of Ralph Tripp, Georgia Research Alliance Chair in Vaccine and Therapeutic Development at UGA, the center has established an extensive surveillance network to identify flu viruses in swine that could potentially become human pandemic strains and is evaluating the immune response to flu viruses and vaccines. In addition, the researchers are collaborating with colleagues in China to monitor flu viruses that infect swine and poultry. "Through merging the research expertise of our two institutions, our influenza center is a key component of the national effort to prepare for and help prevent emerging influenza outbreaks, including seasonal flu and pandemic strains," says Orenstein. Emory, UGA and Georgia Tech also are collaborating within a malaria research consortium funded by a five-year contract of up to $19.4 million from the NIAID. Scientists in the Malaria Host-Pathogen Interaction Center (MaHPIC), led by Mary Galinski, PhD, from the Emory School of Medicine and Yerkes National Primate Research Center, are building a "molecular encyclopedia" cataloguing how malaria parasites interact with their human and animal hosts. New mathematical models are helping analyze the details of an infection and identifying patterns that predict the course of the disease and its severity. "New tests from our effort could help us screen for dormant parasites and identify biomarkers to predict which cases will become the most severe, potentially leading to drug discovery and a malaria vaccine," said Galinski. UGA professor of genetics Jessica Kissinger, PhD, who directs the UGA Institute of Bioinformatics, is leading a team that is organizing, distributing and mining the massive quantities of data produced by the project with the ultimate goal of identifying new opportunities to diagnose the disease, which causes an estimated 660,000 deaths annually. "The goal of my team is to integrate the terabytes of data being produced on both the host and the parasite and make it accessible to our mathematical modelers, who are looking for patterns and signals, as well as the global malaria research community to guarantee that this large investment has the biggest impact possible on malaria research," Kissinger says. In addition to flu and malaria, UGA and Emory researchers are making strides against tuberculosis, which kills an estimated 1.5 million people worldwide each year. A team of scientists from the two institutions recently developed the first rapid diagnostic test to identify latent tuberculosis, the most common form of the disease. Latent tuberculosis doesn’t cause symptoms in people who are otherwise healthy, but it can develop into dangerous and potentially deadly tuberculosis in late-stage AIDS patients and other vulnerable populations. The diagnostic test—developed by UGA Athletic Association Professor of Infectious Diseases Fred Quinn, PhD, and Henry M. Blumberg, MD, professor of medicine in the division of infectious diseases at the Emory School of Medicine—measures the concentration of proteins that are only present if the bacteria that cause tuberculosis are replicating. With $1 million in funding from the Food and Drug Administration, the researchers completed a small but promising preliminary study and are now wrapping up a larger study to verify the effectiveness of the diagnostic method. "The current tests cannot identify latent disease, which may account for 60 to 90 percent of the potential two billion cases worldwide," says Quinn, a faculty member in the UGA College of Veterinary Medicine. "With an accurate diagnosis of latent tuberculosis, patients—particularly those with compromised immune systems—can receive potentially lifesaving treatment." In a project funded by a five-year, $2.8 million NIH grant, Emory and UGA researchers are developing an HIV vaccine that induces the immune system to attack the virus before it can spread through the body. The vaccine uses a virus known as PIV5, which causes kennel cough in dogs but doesn’t cause symptoms in humans, and virus-like particles that mimic the HIV virus. This one-two punch vaccine approach could stimulate immune responses in areas of the body where the virus is known to first infect cells, therefore preventing further spread. "In the past 30 years of HIV vaccine research, we have learned a lot about how to generate immune responses that might protect people from infection. However, we don't yet have a vaccine that we know for certain will protect individuals from HIV," said Emory Professor of Pediatrics and Microbiology Paul Spearman, MD, who is collaborating with Biao He, PhD, the Davison Distinguished University Chair in Veterinary Medicine at UGA. "I am delighted to be working with Dr. He, the world's expert in the use of PIV5 as a vaccine. Together we are optimistic that this prime-boost vaccine approach will generate immune responses to combat the virus in mucosal sites such as the gut. If successful, this will prevent the very early phase of HIV spread and could protect against HIV infection and AIDS."